I’ve been waiting for two years now to bling Owen’s backpack like we did when Maddy started Kindergarten, but I knew I couldn’t make felt flower pins for him. He needed something cool, something quick, and something totally big-guy. 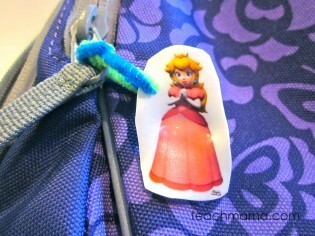 And what better backpack bling for a rising Kindergartener than Mario Brothers Shrinky-Dinks? 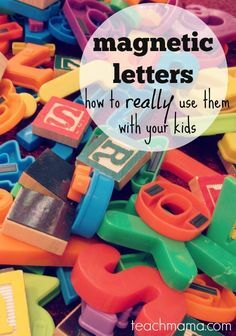 I’m not talking store-bought, super-expensive Shrinky-Dinks, either; I’m talking we searched for images that the kids liked, we saved them onto a file, and we printed them onto special Shrinky-Dink paper. 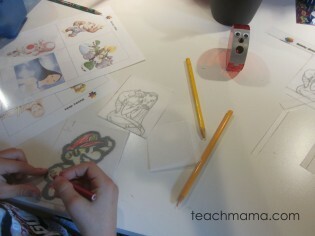 And we also searched for characters that the kids wanted to color. 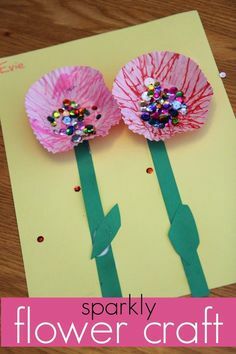 We added them to the mix and they beautified them with colored pencils. But I bookmarked a post by my friend Christy of Superheroes and Princesses waaaay back when, and we just used her idea today. So thanks, Christy, for the inspiration! 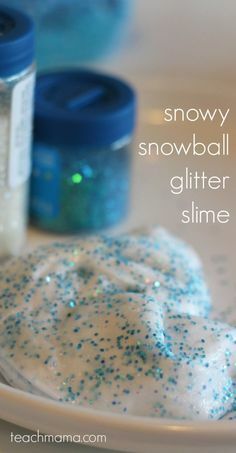 Blingin’ the Backpack, Boy-Style: I like to send my kids off to school with a little something special, something that they like, something that will make them smile. 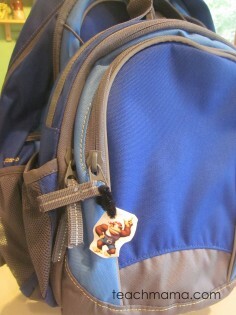 I like to help them bling out their backpacks. 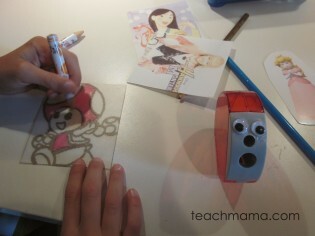 Maddy colors a Toadette. . .
I’m sure that it’s not going to happen much longer with Owen, but he was game this year, so I ran with it. But I knew that I had to play on his faves in order for him to be even a little bit interested, so I asked him–while we played a few rounds of Word Feud: Hey Owen, if you were going to have any kind of character on a keychain, who’d you want? He thought for a few minutes and said, Probably somebody from Mario Brothers or Mario Kart. Cool. Like who’s your favorite–your absolute number one Mario guy? Uh, Koopa Troopa or maybe Funky Kong.
. . . and Owen twirls his Koopa Troopa on his colored pencil. 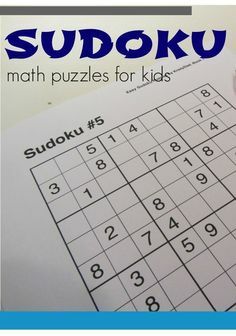 So, I, being the totally-hip mom that I am–down with everything cool for Kindergarten--searched for some Koopa Troopa and Funky Kong images, and I saved them on my computer in one document. Then I did the same sort of shady, top-secret character inquiry with Maddy and Cora. They, oddly enough, answered me without hesitation or question about why I asked, but they gave me Mulan, Hannah Montana, Pocahontas, Toad and Toadette (from Mario Bros), Princess Peach, and My Little Ponies. I added their faves to the document, and I lightened the colors (according to the directions, you need to do this with photos). Cora grabs her (twisted–waaaah!) Toadette. Then I called everyone to the computer to tell them what I was doing: Remember at the craft store when we picked up that special Shrinky-Dink paper? 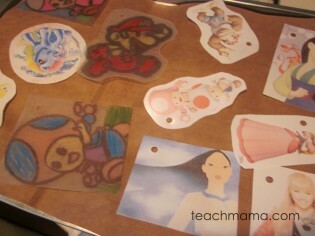 Your totally amazing mom found all of your favorite characters–and we can print them on Shrinky Dink paper, color the ones that are blank, shrink them, and add them to your backpacks this year. HOW cool is that?! 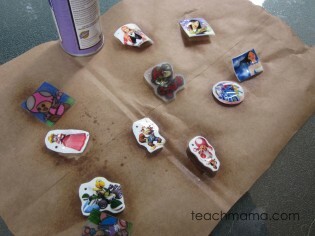 Shrinky Dinks: cooled and sprayed and ready for backpacks! They agreed that it was pretty. darn. cool. So I printed out the images on the special paper. 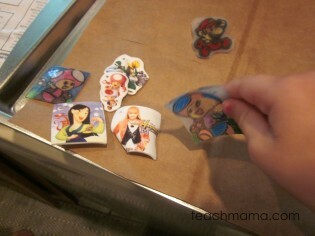 We used Shrinky Dinks for Computer InkJet Printers and Shrinky Dinks Frosted Ruff N’ Ready sheets for coloring. They were not cheap, but I had a coupon, which at craft stores equals big savings. se puppies (probably a little too long). 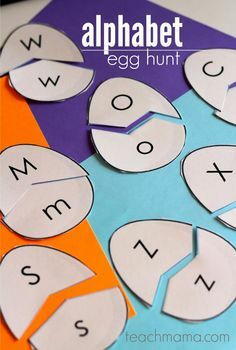 I tried to flatten gently–according to directions–but it was hard because we had put so many on the tray. Some shrunk down perfectly, but others got crazy and twisted, which I think is cool but which sent Cora into mad tears. I explained it was our first time, that sometimes it takes many tries to get something right, and that we can make more tomorrow, but it didn’t help. We sprayed them with sealer, let them try, and headed off to Baltimore for the afternoon. Later in the day, when I was ready to revisit our Shrinkies, I put a pipe cleaner, about 3-4″ long, through the hole of each one and twisted them into the zippers of the kids’ backpacks and lunchbags. They looked so cool. I think I may be in love with Shrinky Dinks. I may make Maddy, Owen, Cora faces and hang them on a necklace. Or something. 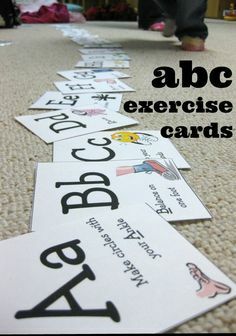 And that’s that–just a little bit of fine-motor, creative-thinking, coloring, Shrinky Dink, backpack-blingin’ fun before school begins next week. Here’s to a happy 2011-2012 school year! 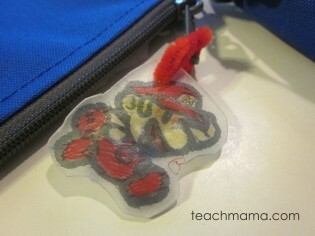 Love, love, love this simple and adaptable-for-anything idea and seriously may be Shrinky Dink obsessed this year. Watch out. 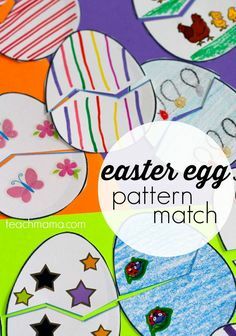 What a cute and fun idea!! 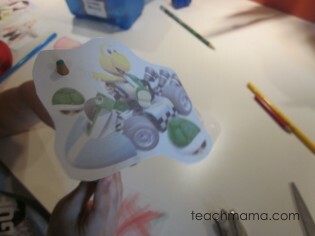 I’m going to have to make a run to the craft store and look for this shrinky dink paper. thanks! Please take photos of yours and share them!! thanks, Jackie!!! 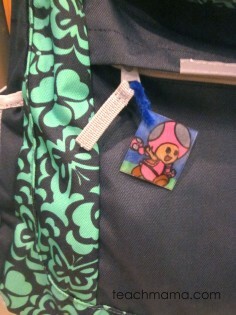 Poor little sweet nephew–if you do bling his backpack, please take picts–I’d love to see it!